I welcome you to check out the updates to the home page if it's been awhile. I have updated the rewards, and add-ons. The Treasure Chest was updated to include even more stuff. But enough of that! Time for the big event! I respectfully invite you to partake in a truly fascinating experiment. Ladies and Gentlemen, nothing like this has ever been attempted on Kickstarter. We're all going to play a game. Normally we hit a stretch goal and unlock something. This time, it will be interactive. Backers pledging 100.00, in any shape or form have a chance at winning actual treasure, in a live action game we will all watch unfolding, right on the Maelorum home page. Only these, our brave Maelorum Heroes, will be able to risk an attempt to seek glory and fame. The treasure they find in the game, is real, and will be included in their rewards. But, like real Heroes, if four or more can destroy the end boss, it unlocks the TREASURE CHEST 2, which will become available to everyone. It will take several backers fighting together to destroy the end boss, so come and join the fight! But beware. The Heroes risk real consequences if they fail. And, people WILL fail. Read the details below. Those who want to get in this game, please be pledged at 100.00 and be prepared to at least stay pledged at that level until funding ends. When I have at least fifteen Heroes volunteering to conquer the Dungeon, I will begin the game. I will accept late stragglers up to 30 Heroes for so long as the end boss remains alive. If more than 30 people want to play, I will consider it on a case by case basis, but more than 30 will be hard to track and email constantly back and forth. To begin, you will email me your backer name, and a photo of yourself. I will crop your face onto the hero pic, and post your stats on the game board. You will get HP, DEF and Persona, just like in the real Maelorum game. I will email you back the rules, which includes not sharing your findings with other backers on pain of your Hero's instant death, and loss of all treasure. I will narrate the game like a dungeon master, everyone will be able read the opening lines of the quest, from then, you will email me your next move. I will then start moving the Heroes for all of us to watch advance throughout the dungeon, and email you back the results of your move. Traps, monsters, and failing at puzzles will reduce your HP. Other backers may even attack you, or turn into Goblins themselves. You can trade me back treasure to get healing potions and armor, in order to win exclusive merch. Everyone will move one step at a time, and we will all wait until everyone is caught up before moving on. I expect to update the game board once a day, or every other day. There will be at least three puzzles / challenges. Read the rest for more details! The complete rules will be emailed back to you once you sign up by agreeing, and sending me a photo of yourself! Can people play as a MALE ROUGE btw? or as a FEMALE WARRIOR? is it strictly male this female that? @Midian, when we get to 15 Heroes I will start the game. My guess is we will fill up tonight and begin tomorrow. I need a pic before anyone can enter! You can start late, I will grant up to 30 people access to the dungeon. First come, first serve! Hope people are reading these updates so no one misses out, of course this isn't for everyone! I need to receive updates from you regularly via email or you'll get swallowed by fog and left behind. i dont have access to pictures right now & this computer does not have a camera on it. they are on my other computer & my camera has already been packed up. i started moving yesterday & am finishing today. i wont be able to enter until tomorrow or the next day. is there a date that we can no longer enter or what is the time frame that you are giving the stragglers? & yes, i did pledge the minimum for entering. Seven Heroes stand ready! The game begins when we get 15 people willing to take the plunge. 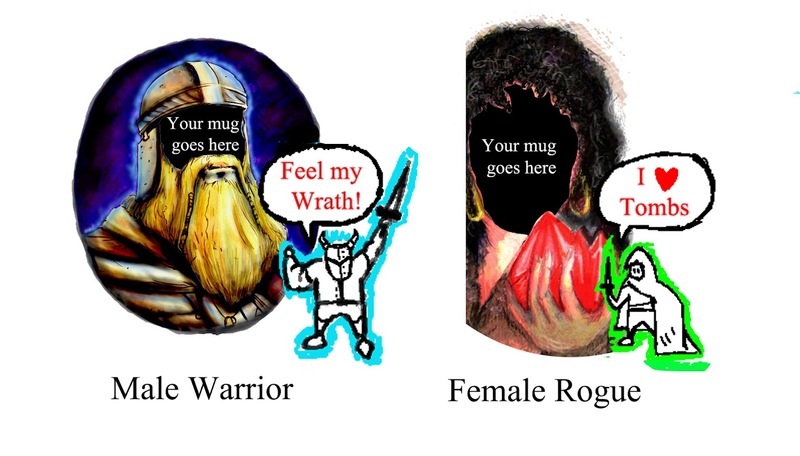 And can I say, if we don't get some female Rogues to help these Warriors they're gonna be in a lot of trouble! The game will conclude near the end of the project, because they don't let you update the page after funding ends. I also like Matthew's idea, but, Heroes will die in obscurity without recognition, that to me is true Heroism, to make a selfless gesture. I'm not saying I won't take Matthew's suggestion, but please move forward knowing the rules still stand as is. Knowing there is risk involved, makes it fun! There's 10 or so days left for this Kickstarter. Will this game conclude by then or will it continue past the end? I'm thirding Matthew's idea. $100 is a hefty investment, but this makes it pretty tempting. Just so we're clear, this game is underway now? Three Heroes have entered the Dungeon. Who's next? Think I'll try jumping in. @Matthew, I have people lining up. I will revise things as we go, a champion and fallen hero page might work out, but for now...that is the real consequence of dying in the game. Perhaps cruel, but we are dealing with a 1000 year old Goblin King, folks, he's ill tempered. haha ok, i am so in then, sending it when i get home. I think the dwarf image our faces will be in is cool... but will cover up most of out faces as mentioned, i think if our entire heads were cropped onto a warrior body that could work perhaps :). Also i think its a bit slack to simply say" you died trying to help the backers? oh well no mention for you in the backer book!" i think it would be more intresting if you had certain little areas in the backer section. LOL you will be mostly hidden behind that big beard though!